There are currently no categories available for COURSES. A NEW FAVOURITE... and only available through Bees Are Life. 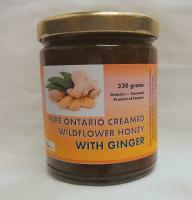 Only 2 ingredients, Ontario Creamed Wildflower Honey and ground Ginger. Spicy, bold and a bit hot to stimulate the senses, and what a combo they are! HOORAY ... it's back! EXCLUSIVE to Bees Are Life! 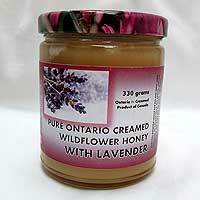 This delicious creamed Raw honey infused with organic Lavender oil will have you coming back every day for more. A delicious alternative to jam. A lovely and light RAW honey, predominantly clover in source, it has NEVER been heated, and preserves the pollen and beeswax content. 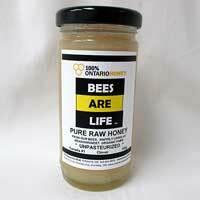 Our beehives are on an organic farm, on Warden Avenue at Stouffville Rd. 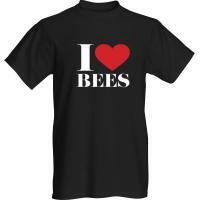 100% Cotton T-shirt, wear it proudly to show your love of bees.